Scott Robertson Workshops are designed to inspire and to educate. 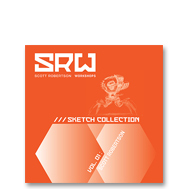 As we strive to improve upon this mission, we have created the SRW Sketch Collection as something you can refer to whenever you need a little reminder of the rewarding creative experiences that the sketches in the booklet represent. Categories: Books, sorry you missed us // out of print. Tag: scott robertson.